The Carly A is a 2002 57′ Johnson Boat Works Carolina custom Sportfisherman. We upgraded her in 2008 with new paint, 12KW Northern Lights generator, shaft tubes and a whole list of extras. With top notch electronics, she will get you to the offshore fishing grounds in comfort and safety. The salon is spacious, air conditioned and well appointed. With a 17.5′ beam, the cockpit is huge, all business, and outfitted with tournament grade tackle and a Release Marine fighting chair. 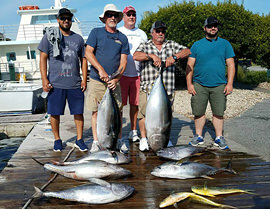 Fishing full time out of Pirate’s Cove Marina at Oregon Inlet, home to some of the world’s best sport fishing, we are now booking trips for the season. This boat was born to fish and is rigged and ready to take you on your offshore adventure.